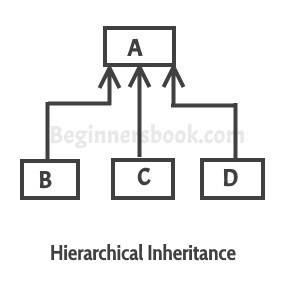 As you can see in the above diagram that when a class has more than one child classes (sub classes) or in other words more than one child classes have the same parent class then this type of inheritance is known as hierarchical inheritance. We are writing the program where class B, C and D extends class A. The methodB() is defined in both class B and Myclass but there is no object created for Myclass so method inside this class will never be invoked at all.. Where as method of class A is invoked through objects of class B C and D respectively… Don’t get confused with method overriding.. But what is the use of placing Methodb() in myclass when it is not invoked. its clear and simple. thanks for the explanatory example. can u please explain why my class is used here? myclass is the name of the class. u can give any name to the class . eg: myprogram , abc, alpha etc. you have used only a…you are not at all inherited methods of b,c ……then how hierarchical exists..